…and that is what the Bloomberg Square Mile Relay is all about. 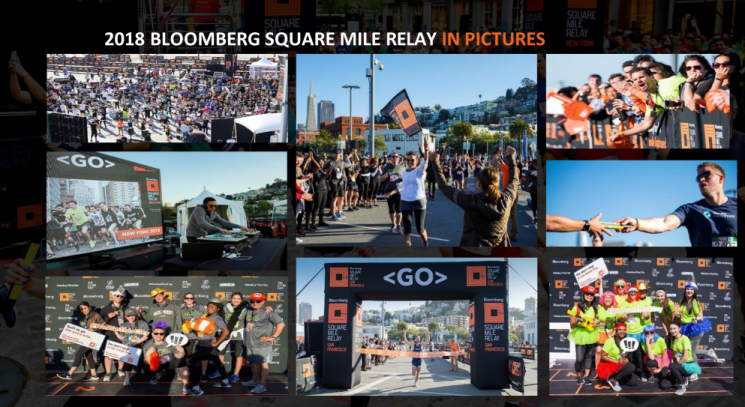 The Roaring Fork Agency is working with Benchmark Sport out of London, United Kingdom to help organize, put together corporate teams, and promote the 2019 San Francisco Bloomberg Square Mile Relay which is being run on Thursday – June 6 at Pier 27 on the Embarcadero. What exactly is the Bloomberg Square Mile Relay you ask? 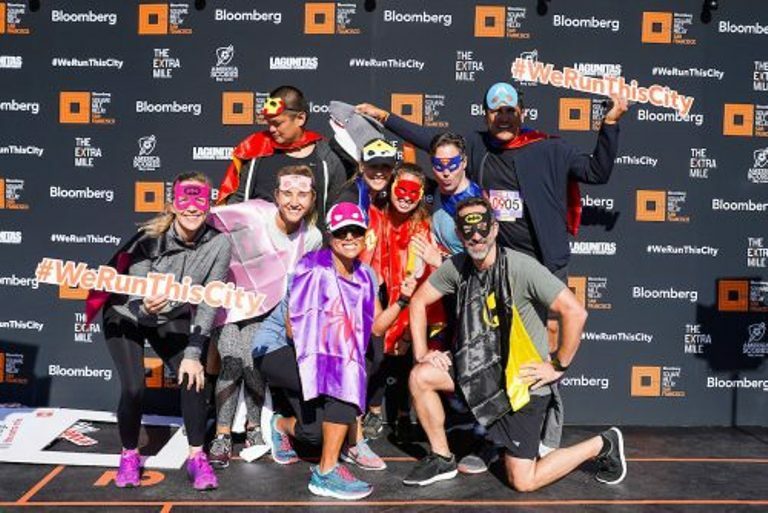 The Bloomberg Square Mile Relay is a relay race made up of teams representing companies and organizations, and each team is made up of 10 runners who each run one mile around a set track who then pass the relay baton on to the next runner until all ten runners have run one mile. Yes, this is just like the relay race with a baton that most of us ran in high school only this time each runner on the 10-person team is running one mile for a total of 10 miles run for every team. Your lap. Your cause. Your impact. 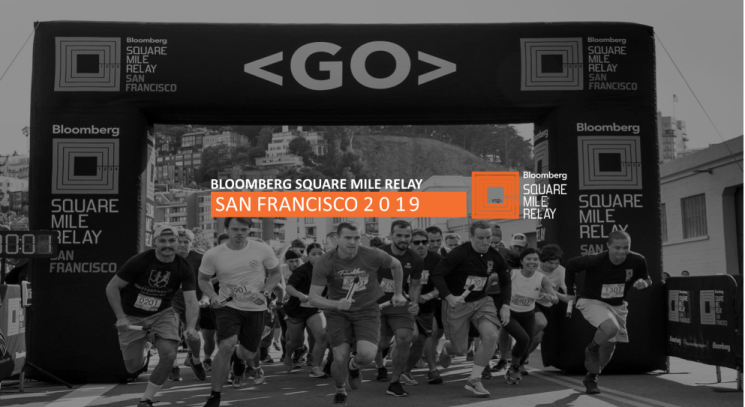 Team entries are now open for the 2019 Bloomberg Square Mile Relay in San Francisco! The race returns to California on Thursday, 6 June for the third year in a row as part of the 2019 Global Series which has expanded to 12 cities worldwide! This is not your ordinary running race – every participating company supplies 10 employees to complete each team, all of whom will run the stunning one-mile (1.6km) course located on Pier 27. For 2019 we are excited to add the Fastest Female Team category to the event. 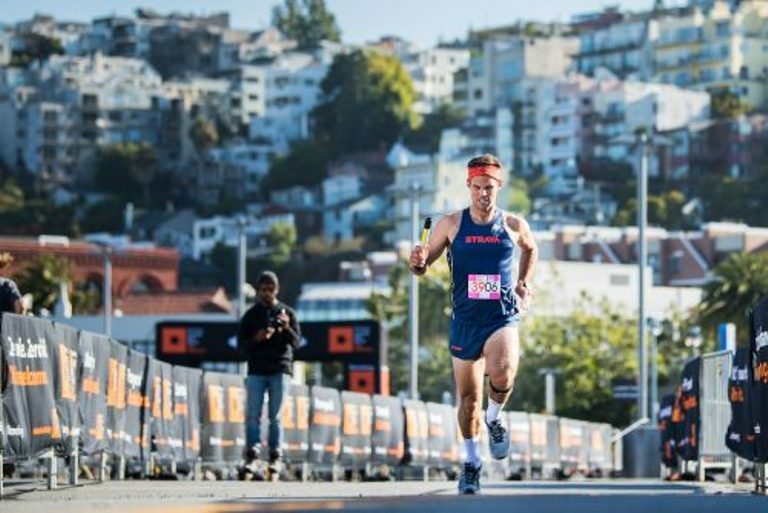 With record numbers competing in our relays across the globe already in 2019, we are anticipating this year’s San Francisco leg of the Global Series to be even bigger than last year’s, with space on the starting line likely to be tight. Number of team places available at the Early Bird rate are limited, so book early to avoid disappointment! 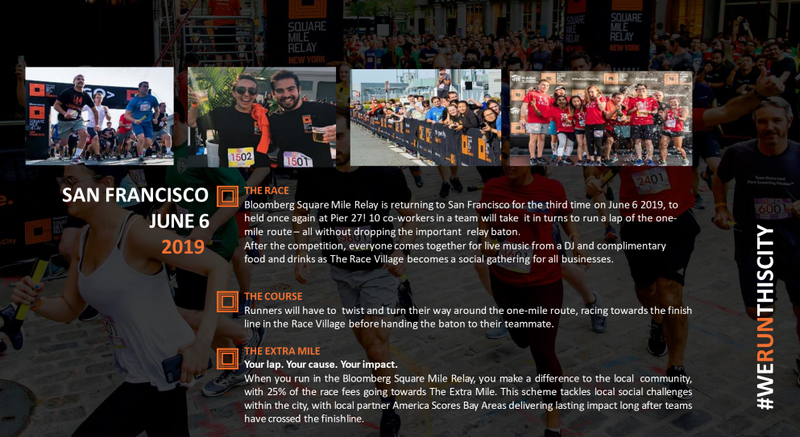 If you have any questions about participating in the 2019 San Francisco Bloomberg Square Mile Relay or about Sponsoring the San Francisco BSMR race or any or all of the other relay races around the world just give us a call at 415 730 – 4854. For a few decades now Event Sponsorship has been a way for companies and brands to directly reach consumers in places where consumers are actually at, such as at football games, racetracks, running events, musical concerts, etc., but in today’s world with consumers immersed in digital media most of their waking hours and traditional advertising not having the power to move consumers the way it has in the past, a new kind and very effective marketing approach is becoming one of the few ways to reach consumers directly. Event Sponsorship is no longer just a Sponsorship with companies hoping they connect with consumers by having their brand plastered all over events, but rather Event Sponsorship + Experiential Marketing at the site of the event that is used to both deepen relationships with consumers and to give them a personal experience they could never get through a digital device may just be the very best way to drive sales and expand market share. “Brand Channel talked with Breithaupt about Citi’s approach to experiential marketing and how it works for the brand. Why does the experiential approach hold so much power for Citi? Experiential marketing is a key component of our overall marketing strategy. For us as a brand at Citi, it allows us to bring the brand to life and connect with consumers on a deeper and much more emotional level. It’s one of our more strategic approaches to connecting with consumers. We’re proud of our unique connection as an emotive brand, and it is a great differentiator for us in our category. How are you leveraging it to engage with customers in a deeper and more meaningful way.? “Bringing the brand to life” is what Event Sponsorship + Experiential Marketing is all about and Citi has shown that being omnipresent at events, particularly musical events, is a great way for Citi to directly reach consumers which helps to build deep and long lasting relationships which are fundamental to expanding consumer market share. The “98 percent of consumers say they’re more likely to buy a product after attending an activation” is a stunning number that should get the attention of marketing executives at companies that are always interested in reaching out to consumers directly which they hope will then turn into sales for their company’s products and services. Event Sponsorship + Experiential Marketing is now an incredibly effective path to reach consumers and at events companies need to go beyond just having their name and brand everywhere for people to see, but they must also build interactive, friendly, engaging, and memorable activities at those events that create the deep relationships with consumers that will lead to long-term customers. The Roaring Fork Agency works with over 100+ events across America every year to help them find corporate sponsorship that create opportunities for companies to put together an Event Sponsorship + Experiential Marketing relationship with those events to reach consumers directly in places where consumers are happy to hear from real human beings, i.e. not a digital ad of some kind, that can help improve their lives. 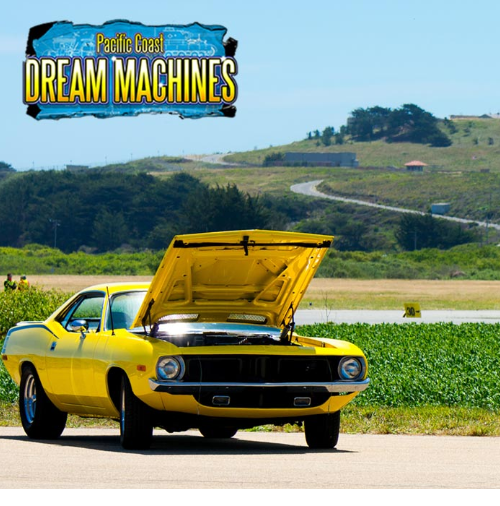 One of the event companies we work with at the Roaring Fork Agency is Miramar Events in the San Francisco Bay area that for decades now under the leadership of company owner Tim Beeman has put on some of the most innovative, interesting, and consumer-friendly events on the West Coast. "The Coolest Show On Earth"
WHEN: April 28, 2019, 10 a.m. - 4 p.m. WHEN: May 4-5, 2019, 10 a.m. - 6 p.m. 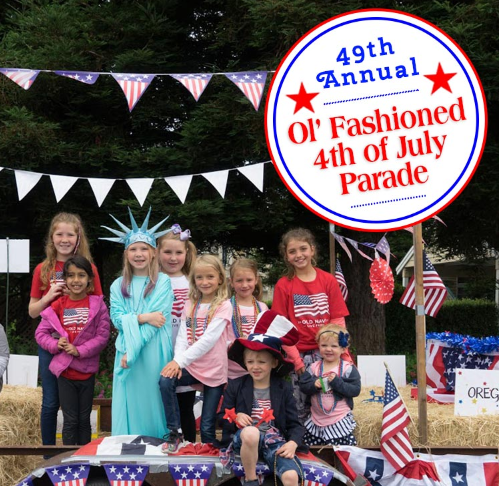 WHEN: July 4, 2019, Parade starts at 12 noon and lasts approximately 90 minutes. "Hot Fun In The Summertime"
WHEN: July 20-21, 2019, 10 a.m. - 6 p.m.
"A Festival Like No Other"
"World Heavyweight Championship of Gargantuan Gourds"
"World Pumpkin Capital Celebrates The Great Gourd"
There are of course Sponsorship Opportunities available at all of the above 2019 Miramar Events, but to really reach consumers Event Sponsorship needs to be combined with a clear strategy of Experiential Marketing to really make your marketing dollars payoff and the Roaring Fork Agency can put your company’s brand, products and/or services on the ground in front of happy and engaged consumers at these Miramar Events or at over 100+ other events around America. Event Sponsorship + Experiential Marketing is going to be one of the last places that companies will able to meet and engage with consumers directly as the world continues to evolve deeper into a digital reality, and the Roaring Fork Agency stands ready to promote your company at the above Miramar Events or another 100+ events across America in 2019 and beyond. Launching A Global Brand Sponsorship Campaign With A Limited Budget - Target and Measure and Measure Some More! We here at the Roaring Fork Agency have been talking recently with an established middle-sized but fast-growing American company about launching a worldwide global brand sponsorship campaign with the challenge being this company would like to expand its reach into new markets around the world without spending a whole lot of money = under 5 million dollars total. Event sponsorship is an efficient way to introduce a company brand into new markets because unlike digital advertising which is easy to execute but can be hit and miss with a lot of fraud to boot and thus can be a major drain on company marketing dollars…see the latest on this problem in New York Magazine…. …a company can be assured that if it sponsors “X event” in “Y market” it will get “Z number” of people that will see its company brand that will not just be a guess based on faulty and often pulled from the sky data like with digital advertising. The Forbes Agency Council recently asked marketing experts how a company could go about launching a global brand sponsorship campaign and came up with some great advice that we are going to add to our approaches to doing sponsorship campaigns in America and around the world especially for a company like our client focused on really getting the most bang for their buck! As the late great David Ogilvy, legendary advertising man and founder of the ad agency Ogilvy & Mather, said when it comes to whether advertising is creative or not which we always have uppermost in our minds…. ….the focus at the Roaring Fork Agency when executing sponsorship plans for our clients is to emphasize on getting the company’s brand and offerings into the targeted marketplace in front of the right potential customers so that it leads to increased sales of the company’s products and/or services. With the above in mind, one of the things we talk to clients about all the time is their specific goals for not only a proposed sponsorship campaign but also whether the goals of the marketing department within the company are FAST. What is FAST exactly when it comes to setting goals you ask? “In 1954, management guru Peter Drucker introduced “management by objectives,” an approach where employees would agree with their boss on a set of goals and work toward achieving those objectives throughout the year. Not even a visionary like Drucker, however, could have predicted how thoroughly goals would come to dominate the modern workplace. In 95% of organizations, according to a recent survey, employees set goals for themselves or their teams. 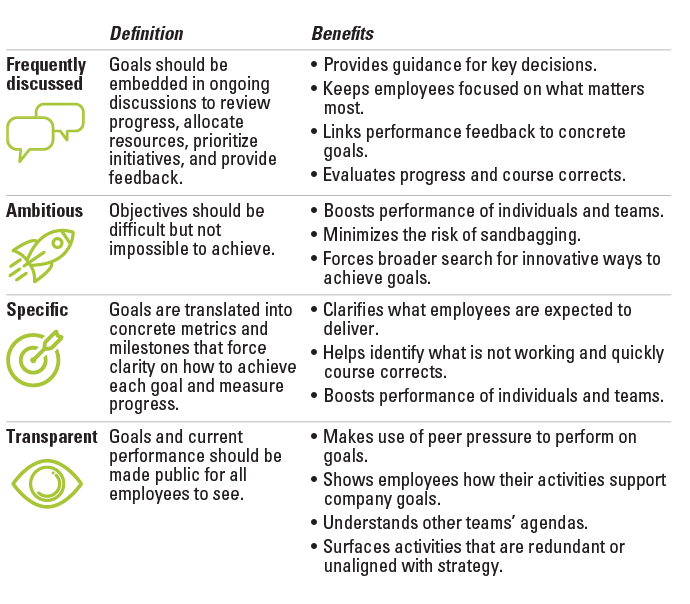 When it comes to setting goals, most managers follow a well-established set of practices. They hold one-on-one meetings with their subordinates to set goals, and then they review performance against those objectives at year end and link their appraisal to promotion and bonus decisions. These same managers aspire to make their goals SMART, by ensuring they are specific, measurable, achievable, realistic, and time-bound. The conventional wisdom of goal setting is so deeply ingrained that managers rarely stop to ask a fundamental question — does it work? The traditional approach to goals — the annual cycle, privately set and reviewed goals, and a strong linkage to incentives — can actually undermine the alignment, coordination, and agility that’s needed for a company to execute its strategy. Expecting employees to hit 100% of their targets to earn their bonus, for example, creates strong motivation for them to “sandbag” by setting conservative targets they are sure to achieve. And when goals are kept private, employees don’t know what colleagues in other teams are working on. Goals can drive strategy execution but only when they are aligned with strategic priorities, account for critical interdependencies across silos, and enable course corrections as circumstances change. If these conditions aren’t met, every employee could achieve their individual goals, but the organization as a whole could still fail to execute its strategy. If the traditional approach to goals cannot ensure successful strategy execution, what’s the alternative? Over the past few decades, a handful of leading companies including Google, Intel, and Anheuser-Busch InBev have pioneered and refined an alternative approach to harness the power of goals to drive and align action. To understand how this new approach works, we studied these companies and others, analyzed a proprietary data set of more than half a million goals, and reviewed the academic literature on goal setting. If the sponsorship campaign was able to achieve those goals and if not, why not? Like our client that is now looking at doing a global brand sponsorship campaign to drive their company and brand into new markets in an efficient way as possible with a limited budget, if you are interested in talking with the Roaring Fork Agency about how we can help you expand your company’s reach around the world with sponsorship we can be easily reached and are ready to talk to you at the below numbers. Following on our last RFA Blog post…. “In the world of NASCAR, partnerships between teams and outside organizations are a key component to a race team’s success. From being a source of revenue to helping with marketing, when a team creates a healthy partnership with a business, both sides reap the benefits. Veteran Monster Energy NASCAR Cup Series (MENCS) driver Aric Almirola has continued his partnership with Go Bowling this season, while the company has also partnered with his Stewart-Haas Racing his teammate, up-and-coming NASCAR XFINITY Series (NXS) competitor Cole Custer. For Go Bowling, which operates more than 3,000 bowling centers across the United States, there is a draw of being associated with both a veteran driver and young, new talent. The company will be on Almirola’s No. 10 Ford for the Watkins Glen MENCS race and on Custer’s No. 00 machine for the NXS race at Richmond Raceway in September. Create New Customers for the Sponsor! Of course, for followers of advertising this book is a follow-on to the must read advertising book for decades now from founder of the ad agency Ogilvy & Mather, David Ogilvy, who wrote Ogilvy On Advertising in 1985. “Question: David Ogilvy’s Ogilvy on Advertising has been the bible for aspiring advertising and marketing professionals all over the world. Why did you write this book now and do you think it was the right time? 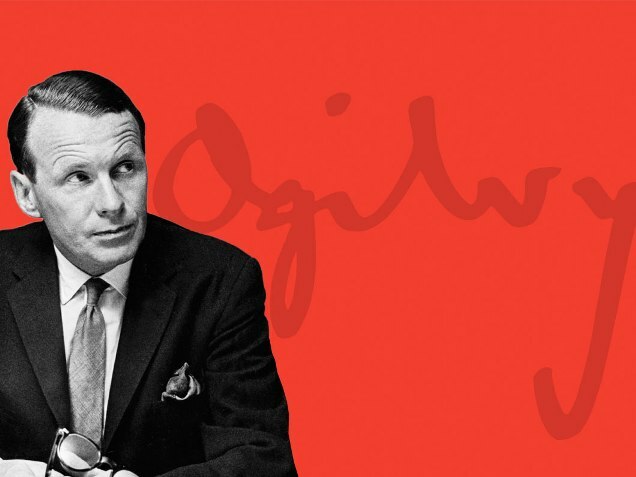 The above David Ogilvy quote goes to the heart of a great sponsorship deal meaning there’s little reason for a company to sponsor something unless it drives more customers to that company. Now let’s watch the below terrific video on Ogilvy Habits that has great advice for anyone on how to run a creative company or any company for that matter! NASCAR Driver Solicits Sponsorship On Twitter and Gets Help...From Two Other NASCAR Drivers! - The NASCAR Sponsorship Problem....FOCUS! 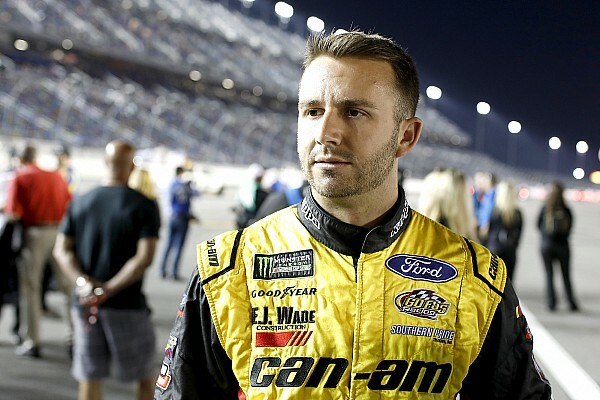 This was a remarkable week in sponsorship with a NASCAR driver, Matt DiBenedetto, soliciting sponsorship for his race team over Twitter and getting a response from two fellow NASCAR drivers, Denny Hamlin and Kevin Harvick, who said they would be more than happy to help out! A NASCAR driver’s plea for sponsorship is answered…by his competitors, Nick Bromberg, Yahoo! With the 2018 NASCAR racing season now underway it’s no secret that NASCAR has seen declining television ratings in the last decade-plus that have led to drivers, tracks, races, and even the entire NASCAR series itself having problems in securing adequate sponsorship. In 2018 NASCAR is gearing back to 30 races from 36 which some think could be an answer in not having so much inventory in the marketplace to sell…. ….but it’s not really the number of races, or rules, or anything else that is causing the decline in interest in NASCAR in recent years. All sports are played or performed by human beings, and ultimately it’s interesting and compelling human beings that draw fans and television viewers to events, and for the past decade-plus at least NASCAR has been devoid of any major stars that would attract the attention of the average sports fans to get them interested in the NASCAR product. This is an issue that NASCAR can address by better marketing their drivers in the marketplace, but as NASCAR does that necessary PR work, it also must keep the sport going and with yet another NASCAR series sponsors, Monster Energy Drink, considering dropping their series sponsorship…. …it’s time for the execs at NASCAR and the sport’s drivers to FOCUS like a laser beam on the fundamentals that will keep their sport rolling along at least at the current fan + television viewing level. It was shocking to see that in the 2018 Daytona 500 that was just run in February for the first time in years had no beer-sponsored cars in the race which speaks to what is becoming a basic disconnect between the drivers, the people that run NASCAR, and the fans of the sport. NASCAR itself, including the race tracks where its races are run, and its drivers should be able to generate a lot more in sponsorship dollars than they have in recent years which has seen NASCAR take its eye off its core fans and their fans main passions + interests. NASCAR and its drivers should narrow their focus for potential corporate sponsors that fit well within the demographic that is attending races and watching NASCAR on television, because there are plenty of companies out there that have a lot of interest in reaching the NASCAR demo, but they are not now being reached out to by people that work on NASCAR-related sponsorship issues. A laser beam focused is what is needed, such as the one that advertising agency consultant Michael Gass recommends to ad agencies when they put together a new business development plan by focusing on just a few core competencies and becoming very good at those core skills. Michael Gass writes about his approach to helping ad agencies finding new business at his blog website, Fuel Lines: Fueling Ad Agency New Business, and NASCAR itself and its teams + drivers could learn a lot and raise a lot more sponsorship dollars by really focusing on just who is attending and watching NASCAR races and then going after companies that really want to reach that audience. The Internet has up-ended entire industries in the last couple of decades, and it is now closing in on the last media “fortress” as well in television that could lead to a fundamental re-shaping of the media landscape that will no doubt also change how everyone watches television as well. “FANG (Facebook, Amazon, Netflix, Google/YouTube) is about to take a huge bite out of traditional network TV (ABC, NBC, CBS and Fox), and the media business will never be the same. To understand the profound implications of the recently announced NFL on Amazon Prime or YouTube TV, it may help to understand the economic engine that drives traditional commercial television. The goal of the commercial TV business is to package a specific, targeted audience and sell it to the highest bidder. The more precise the targeting, the higher the fee; the bigger the targeted audience, the bigger the fee. Because the broadcast television industry is data poor (it only offers metrics about itself), this model has never been a complete solution for brand or lifestyle advertisers. In practice, an advertiser needs to translate ratings and demographic information from Nielsen into knowledge and insights it can link to its key performance indicators (KPIs). Because content is distributed across so many non-TV platforms, this process gets more difficult every day. How effective was your broadcast TV buy? Was there an increase in sales that could be attributed to it? Could we have spent this portion of our advertising budget differently? “TV is data poor” goes right to the heart of the problem with television and shows the big advantage that FANG (Facebook, Amazon, Netflix, Google/YouTube) has over television that will just continue to accelerate in the future because advertisers will demand that TV figure out a way to justify the advertising dollars it is receiving, or even better find a way to move their programming onto the Internet so usage by consumers can be more closely tracked, monitored and acted upon. That TV is now under assault by the Internet has huge ramifications for Sponsorship, because companies spending money on sponsorships are increasingly asking for proof that those sponsorship investments are paying off in consumers seeing their company’s products and services in the marketplace, and that those eyeballs are translating into bottom-line new business coming through the door. The software and technology company SAP which annually spends $50M+ on sponsorship…. “When I say the words corporate sponsorship, what do you think of? Logo placements. Official status. Fancy private events. What SAP is attempting to do in measuring the impact of its sponsorship dollars on current and potential new clients in the marketplace is a critical issue for sponsorship to solve so that when a company is considering making a sponsorship investment there are systems in place to measure how effective the sponsorship is in engaging consumers and creating new business for the company. “Events drive leads for sales and are a powerful networking tool that enables companies and brands to connect with their audiences and clients face to face. At least, that’s what we know. But as any marketer, sales rep and event organizer will tell you, qualifying those collected leads is anything but certain. Because not all leads are created equal, and every individual at your event has their own unique journey to the final sale. According to Statista, only 14% of B2B marketers’ budgets are being allocated for in-person trade shows in 2015. Because of this, event marketers are pressured to find the metrics that matter when it comes to proving value. Traditionally most event organizers and sales reps have focused on the data that is generated before and after an event, which gives a good picture of who showed up, but not much else. Here are 5 ways that event marketers can use the data that is being generated before, during, and after their events to create a richer experience for their attendees, while providing insights into the value of their show. ….in the United Kingdom can help us to create platforms that focus in on and around an event to determine the amount of interaction among event participants on all kinds of different platforms which gives the sponsoring company a good idea of how its sponsorship investment is paying-off with real world outcomes. …and with that in mind we here at the Roaring Fork Agency are interested as always in working with companies and advertising agencies that are looking for events to sponsor that will create a lot of buzz and more importantly bring lots of new customers through the door with their wallets and purses open ready to spend their hard-earned money! Two posts in particular by The Sponsorship Space in January 2017 caught our attention at the Roaring Fork Agency, and we thought we would pass along some of their great information. “Sponsorship has evolved into a sophisticated marketing technique that goes much beyond promoting awareness and association of an event to a brand. Sponsors now know that the most authentic way in which they reach their targets is to provide and support an exceptional experience that the target will have with the event and their interaction with the sponsored product. Whether it is a team, a sport, an event, a cultural undertaking, the most powerful way in which a sponsor truly connects to a customer is to show that customer how their brand has added to the value of the experience. This can be through enhancing a live event, through digital or socially connecting with a customer as they experience the event through broadcast or even after the event where the sponsor allows the customer the opportunity to re-experience powerful moments of the event. These areas of brand affinity are harder to measure and a future conversion is a harder connection to make to bottom line profits so going forward marketers and sponsored experiences will need to work well with research, data analytics, and people to see the fully realized value of a sponsorship over a longer arc of time. “The days of a Sponsor only looking for a signage asset in left field, on the stadium scoreboard, or on the rink boards, are few and far between. Marketing executives are being challenged more and more by their company executives to prove the ROI and ROO of company sponsorship spending. Companies want tangible results, as budgets are further scrutinized each year. Heading into 2017, sponsorship salespeople (clubs, leagues, venues, events) are being challenged more than ever. Sponsor companies are looking to take partnerships further, to integrate products or services into agreements and to customize property content so that brands feel immersed in the relationship. When all is said and done, the mark of a successful partnership in the eyes of the sponsor, is whether consumers can fully understand what the sponsor company offers in terms or its products and/or service offering. If a consumer cannot answer that question, the effectiveness of the sponsorship should be evaluated. Today’s sponsorship equation is about finding a balanced win-win-win between 1) The Sponsor Company, 2) The Partner Organization and 3) The Consumer. “The trend in the sponsorship industry the last few years has been the move toward data-driven decision making and measurement, which really is an extension of the same shift seen in brand marketing as a whole. Brands are becoming more analytical, boutique specialist agencies have sprouted to support the need to prove effectiveness, and the smart properties have become proactive in providing sponsor-specific success metrics. Most players are now working with the same sets of data and the playing field is more level than it has ever been before. Moving forward, I believe you’re going to see brands getting more and more creative in how they sponsor. With it becoming easier for every sponsor to see the value of each dollar spent on traditional assets – signage, classic media, etc – decisions on these will be made as functions of math equations more than anything else. Conversely, for more content-focused and deeper funnel sponsorship activation, brands will look for new avenues of engagement. Certainly in the form of new property types; E-gaming and other non-traditional entertainment properties are already being gobbled up by the big brands. But for these and traditional sports / entertainment properties, brands will seek more and more assets that can’t be found on a rate card. Creative social extensions, increased property-owned asset inclusion to better leverage built-in fan base, sponsorable streaming content – anything that can be presented organically and with an already-engaged audience. Valuable to sponsors, sure, but even more valuable to properties as the cost to incorporate sponsors in this capacity is often minimal. - and measurement that goes beyond media equivalent value and social media likes. I'm leading the European Sponsorship Association's working group to write a best practice guide to sponsorship measurement - so watch this space! Whilst none of these are revolutionary, I see 2017 being the year that sponsorship catches up to show what a powerful platform it can be. One of the things that is mentioned by almost all of the 30 Sponsorship Executives in the above article, and something that we are seeing from the companies we pitch event sponsorships to is the demand that sponsorship achieve specific goals just as digital advertising campaigns do in the marketplace. “You have your properties and now you have your assets…but you can’t do a sponsorship valuation until you understand your audience. If this is your audience then you can still do a valuation…you just need 10 million of these types of people to generate any money and even then, sponsors want way more than this. Why are these audience segments useless? Because they tell a sponsor nothing about whether or not you have their customer base and makes measuring sponsorship effectiveness impossible for your sponsor. The less you know about your audience, the less likely a sponsor is to trust that you can deliver on your promises to get your audience to take a specific action. What do these audience segments have in common? You can instantly see what they are likely to purchase, their needs, responsibilities etc. and it make build a sponsorship valuation formula much much easier. But you’re not done yet! Once you know your audience segments, you need to know their preferred brands and what purchases they intend to make. The above is some great advice on really drilling down and identifying the people that will be attending and involved in the event you are pitching to a company, mainly because the one thing that companies considering sponsorship opportunities are most interested in is what group of people will see this sponsorship and are those people that will do business with your company in the future? If the person pitching the sponsorship cannot identify who the sponsoring company will be reaching by taking on a sponsorship opportunity then one is going to have a very hard time getting to “Yes’ and that is what pitching a sponsorship is all about….isn’t it? The college football bowl season is upon us with ESPN leading the charge and bowl games getting underway with six bowl matchups on Saturday, December 17 of the total forty-bowl games that will be played in 2016-17. With only 128 college football teams on the FBS level the bowls are now taking 82 of those teams to play in postseason bowl games which has led to a few teams with losing records the last couple of seasons getting bowl invites, something that was unheard of until recent years. “But the name game finally may have hit a wall. Six of this year’s 41 bowl games have failed to obtain similar title or presenting sponsorships, raising more questions about the market appeal of an 80-team postseason that already includes several games with sparse crowds and 20 bowl teams this year with 6-6 records or worse. Twenty years ago, there were 18 bowl games. Five years ago, there were 35, and all of them had a title or presenting sponsorship to help pay their bills. Starting Dec. 17, there will be 41 postseason games through Jan. 9, including the biggest game-changer in the business: the College Football Playoff. After debuting in January 2015, the four-team Playoff sweetened the postseason pot with more money than ever but also arguably made the lower-tier bowl games seem even less attractive to sponsors. The Hawaii, St. Petersburg, Birmingham and Boca Raton bowls don’t have title sponsors this year after previous title sponsors didn’t renew. Another game, The Miami Beach Bowl, has not had a title sponsor after starting in 2014. The national championship game also has not announced a presenting sponsor after two years with AT&T — though the game's asking price is much more, and a deal might come soon. Even at the low end a $500,000 annual sponsorship investment in a bowl game is a large number that probably eliminates the vast majority of private and public companies in America that don’t have the wherewithal to spend those kind of marketing dollars on a bowl game sponsorship. If the bowl games now missing title and/or presenting sponsors are going to convince companies to become involved with their games then they must provide a realistic and well-reasoned return-on-investment (ROI) rationale that will assure a potential sponsor that they will get their bang for their hard-earned sponsorship buck. Reach = How many people will the sponsorship reach? Frequency = How many times will the sponsorship reach people? Relevance = Will the sponsorship reach the right people? In order to examine a real world scenario we will use the 2017 Birmingham Bowl game which is being played on Sunday, December 29 at 2 PM EST between South Florida and South Carolina. Let’s assume that the cost of the Title Sponsorship for the Birmingham Bowl is $500,000 annually. How many consumers approximately will have heard the name of the Title Sponsor at least one time the rest of the year besides December above and beyond the people attending the game and watching it on television = 1.5 million. With South Florida and South Carolina playing in the 2017 Birmingham Bowl which is contractually obligated to take one team from the SEC Conference and one team from the American Athletic Conference, if we assume that the potential Title Sponsor is a company located in and does most of its business in the Southeastern and Eastern United States the “Relevance” for such a company becoming the Title Sponsor of this bowl game would be HIGH. At the Roaring Fork Agency we believe the corporate sponsors we work with should get from their sponsorship investments impressions somewhere between…. ….which puts the potential ROI of 16 cents per impression for the Title Sponsorship of the Birmingham Bowl in a good spot for a potential corporate sponsor. Of course, what really makes sponsorship an effective marketing tool when done right, which usually boils down to matching the right event with the right corporate sponsor is the sponsor, is being able to get a lot more out of a sponsorship than just a bottom-line cost per impression number. “Sponsorship stopped being about visibility decades ago. It’s now squarely about meaning. It’s about brands connecting with their target markets in a powerful, meaningful way, engendering greater alignment, preference, loyalty, and advocacy. If you’re not talking about that stuff, you’re not a compelling sponsorship option. 1. Clearly lay out the meaning of your organization or what you’re doing to the fans. Why do people care? Why is what you’re doing different to the other options for fans? 2. Fan segmentation by psychographics. That sounds complicated, but it’s not. Just segment your fans by the primary reasons they care about the property. If you’re a team, is their primary motivation their love for the team itself? The tribal atmosphere of the game? The social occasion with their friends? Something else? 3. An overview of your marketing plan. How do you nurture your relationship with these fans? 4. Creative ideas for leverage. This is the number one most important part of your offer! How could the sponsor use this investment? What could they do with what you’re offering to achieve their objectives and get closer to the fans? For a sponsor, this is the real “what’s in it for me” moment. Great sponsorship deals that are Win-Win for both parties involved, the event and the corporate sponsor, is ALL about companies and their brands connecting with their Target Markets. In the case of the Birmingham Bowl it is imperative that whoever is representing the bowl game in the marketplace be targeting companies that have consumers today and would have consumers in the future that would have the opportunity to see or hear about the Birmingham Bowl Title Sponsor, and more importantly be able to buy their products or services, which is a great starting point to creating a list of companies to pitch the Title Sponsorship of the Birmingham Bowl to in the near future. It would be impossible to overstate the importance of Inc. Magazine and its constantly inspiring content over the past three-decades plus to entrepreneurs like us here at the Roaring Fork Agency that are fighting like Hell in the marketplace each day to be a success. The above 8 Skills To Qualify as an Adult come from a terrific book written by Julie Lythcott-Harris which is a great read for anyone like us here at the Roaring Fork Agency that are working hard to raise great children! The last story that caught our eyes this past week was from the fascinating folks at Freakonomics who wrote a book of the same name…. ….and have a website of the same name – www.freakonomics.com – that always has lots of interesting and fascinating stuff for people interested about the world around them. …which is a podcast and transcript of a conversation that goes into what anyone would have to do to become great at just about anything. If you don’t have time to listen to the Freakonomics podcast or read the transcript how can anyone become great at just about anything you ask? Lots and Lots and Lots and Lots and Lots and Lots of Practice = How to Become Great! That is a question that has often been hard to quantify in the past in the world of sponsorship, but in this age of technological wonder it’s the billions of bits of “data” that make it a lot easier for both events with sponsorship opportunities and companies making sponsorship investments to see just what kind of bang they are getting for their sponsorship Buck. “Data, and the ability to access and analyze it, already is having a profound, across-the-board impact on sponsorship—from the evaluation, selection, activation and measurement of partnerships by brand marketers to the selling, negotiating and fulfillment of those partnerships by rightsholders of all types and sizes. But as important as the current developments are, we have just begun to scratch the surface of what data can deliver to properties and their partners. Audience remains at the heart of the sponsorship proposition. However, it is no longer exposure, impressions generated or image transfer that drives and determines value. Rather—thanks to data—it is the ability to engage, involve and connect with fans that raises sports, events, entertainment, nonprofit, cultural, association and other partnerships above mere marketing. This is not a recent change; at least not on one side of the fence. Data-led, digitally enabled personalization has been at the heart of many brand marketing initiatives since the turn of the century. More recently, as the technology cost of delivering personalization has been reduced, rightsholders in some areas of entertainment—cinema, for example—have begun to take the initiative in this space. Most others, however, are still playing catch-up. Data-based personalization changes the conversation from which rightsholders can deliver the biggest numbers (reach, broadcast ratings, etc.) to which can deliver the deepest insights, share the most detailed information regarding actual online and real-world behavior, and drive the most actionable results. In the above section of Sam Yardley’s blog post he is right-on-point of increasingly what marketing decision-makers at companies are asking events offering sponsorship opportunities to deliver which is to create an environment where…. …..and that is a mandate that event organizers and the people that represent sponsorship opportunities in the marketplace must embrace by utilizing as much data as possible to deliver a great experience to consumers or risk becoming an afterthought in today’s data-driven world. Luckily, there are some amazing data-driven companies now cropping-up across the United States including Umbel in Austin, Texas which is doing some terrific work in helping events and organizations to harness and utilize the massive amounts of data they collect on their customers and fans. 8. Add Sponsorships That Actually Help Students"
The first four items in Trips Reddy’s above Umbel blog post…. 4. Prove The Value of Online & Offline Fans to Sponsors"
…have become increasingly important in each and every sponsorship pitch that the Roaring Fork Agency now does, and it’s now almost becoming expected that sponsorship opportunities should be able to produce “digital-like” bottom-line data metric projections before the sponsorship investment is made by a company which is something we work very hard to quantify before ever picking-up the phone to pitch a sponsorship. ….which goes right to the heart of still a major problem today which is sports teams and organizations are sitting on mountains of very valuable data that they need to learn how to successfully leverage to not only generate more revenue, but to also better serve the most important thing in their lives: their paying fans and customers! “There is so much talk in the sports industry right now about making programs (collegiate and professional) both smarter and safer. With an increase in research on the effectiveness of safety equipment and individual performance during a game, in addition to advances in wearable and equipment technology, everyone is talking about collecting more data on teams and players. But are sports teams really collecting all the data that’s available to them? As someone who talks to Marketing, Ticketing and Sponsorship teams, I would answer that data collection at most sports organizations is still fairly narrow. The data being collected on players and teams helps improve performance and reduce injuries, but teams are missing the other half of the equation: the fans. Teams are constantly trying to ensure that they provide the best fan experience both at the game and online. By expanding the data they are collecting on players to include fans, sports teams will be able to create personalized experiences both online and offline. So what type of data should sports teams be thinking about? In the end when it comes down to whether a company will make a sponsorship investment or not, it’s often a “gut call” by a decision-maker based upon their opinion of the quality of the event or organization and the individual pitching the sponsorship opportunity, but in just the last couple of years it’s now often the underlying data that drives sponsorship investment decisions which makes it vitally important for people pitching sponsorships like the Roaring Fork Agency to have “the proof” and be ready and able to present that data evidence in the best way possible to that ultimate decision-maker. Another great piece on the growing importance of measuring the ultimate value of sponsorships was produced by McKinsey & Company a few years ago that has been a guide of sorts for those of us here at the Roaring Fork Agency that are always looking for all the help we can get! The above McKinsey & Company piece of sports sponsorship is a great read, but then so is their Marketing & Sales webpage which has lots of great information about many important issues driving marketing & sales both in the Unites State and around the world. …have gotten us here at the Roaring Fork Agency to start thinking about how we go about valuing naming-rights deals for our clients, as well for any universities that might be considering attaching a corporate name to their football stadiums and/or basketball arenas. In the story we referenced above on the current state of Washington State athletics…. “We have to grow the ones we have, but we like to use our imagination and be innovation, and we’ve done that over the last six years here. We’re shifting it to another gear,” Moos said. That could include selling naming rights to Beasley Coliseum or Martin Stadium for the right price. That quote from Bill Moos got us wondering just what the naming-rights for the football stadium and basketball arena at Washington State would be worth, which led us here at the Roaring Fork Agency to putting together a group of about ten variables such as facility type, local population, average attendance, number of games and events, tradition of program, potential media mentions, media impressions, etc., that would lead us to a correct valuation of the naming-rights for any college football stadium or basketball arena in America. Below are the naming-rights valuations we came up for the football stadiums and basketball arenas for schools in the Pac-12 Conference that do not currently have naming-rights deals in place. We believe here at the Roaring Fork Agency that the ideal naming-rights contract for a college or university is a 10-year deal which provides needed stability and income for a decade, but does not overextend the school into alignment with one company at one market price for over a decade. Using the above information and estimated amounts that could be garnered by Pac-12 Conference Schools with football stadiums and basketball arenas that do not have naming-rights deals in place right now, the Pac-12 Conference schools combined are missing out on something around…. Over $30 million dollars will pay a lot of bills in college athletic departments, especially when there are athletic departments like Washington State that are running annual deficits of over $13 million dollars. The Roaring Fork Agency is now working with a few universities on naming rights deals, and after some exhaustive research that led to our agency creating a solid framework on how to value college naming-rights deals in the today’s marketplace, we stand ready to work with any college or university in America to help them both value and land a naming-rights deal that is a win-win for both the university and the sponsoring company. The first, most obvious, step in establishing a successful partnership is identifying your brand's target audience, then choosing a partner that reaches your core audience. Next, marketers need to understand the brand equity of potential partners and select one that can elevate their brand. If companies focus on the above two things when thinking about sponsoring sporting events or any event for that matter they will end up with a more successful sponsorships that create the MUST for any sponsorship investment which is a Return on the Sponsorship Investment. “Nissan has locked down sponsorships for 100 colleges and universities -- from the University of Alabama to the University of Wisconsin -- in what the automaker is calling the "widest-reaching sponsorship in the history of collegiate sports." The four-year-deal includes permanent Nissan signage in hundreds of stadiums and arenas and gives the company the rights to use school logos in TV ads. All told, the pact will cover 22 men's and women's sports at the schools, allowing the automaker to reach 22 million alumni and 188 million fans nationwide, according to estimates provided by Nissan. Nissan did not disclose financial terms. But Jeremy Tucker, VP-marketing communications and media for Nissan North America, called it "massive and complex." "We saw this as a white space," he said in an interview. "There is no one activating it in automotive at this scale nationally 11 months out of the year, always on." Brand image alignment – The Nissan brand aligns very well with college sports fans. “There will be plenty of on-the-ground marketing, too. This weekend, for instance, Nissan is setting up face-painting booths at several campuses at which the deal begins immediately, including Ohio State and the University of Southern California. All 100 schools will be active in 2016. The pact includes a sponsorship of the University of Texas vs. University of Oklahoma football game, known as the Red River Showdown. Other schools included are UCLA, Duke, Notre Dame, University of Michigan and plenty of other big-time programs. Kudos to Nissan and their lead creative agency TBWA, Los Angeles along with some help from the digital agency Critical Mass on the “Diehard Fan” app for creating a very unique branding campaign that during this past football season was seen and experienced by millions of fans of college sports and which will continue running into 2016. In recent years college athletic departments have been taking in record amounts of revenue from both the long-running NCAA Basketball Tournament and the just started-up last year College Football Playoff, but postseason tournaments are only part of the story of the large amounts of money that is being generated and spent on sports teams on college campuses in America. USA Today was out last week with their annual NCAA Finances database of the top 200-plus colleges in America which lists how much athletic departments raise and spend in fielding their sports teams, and not surprising the universities of Oregon, Texas, Michigan, Alabama and Ohio State are at the top with the Oregon Ducks athletic department taking in a gargantuan amount of almost $200 million dollars in 2013 - 2014. “Two years ago, on an afternoon in his final spring as the University of Texas athletic director, DeLoss Dodds attended two meetings. One was to discuss the Longhorns' foundering major sports teams. The other was with a group of executives from Chevrolet. The conversation with Chevrolet led to a lucrative sponsorship for UT - $4.8 million in cash over three years from the automaker and a new Silverado HD pickup truck worth $63,885 that was dubbed "the official truck of Bevo," the Longhorn mascot. The contract is one of 19 corporate sponsorships that will provide UT athletics and marketing partner IMG College with $16.4 million in cash, products and services this year, contracts obtained by the San Antonio Express-News show. Through 2021, the multiyear agreements add up to $98 million. Dodds' successor, Steve Patterson, believes the corporate largess can help UT address those still-relevant questions about performance. As the nation's wealthiest athletic department shakes up its coaching staff and seeks a return to on-field glory, its quest is being funded in part by an impressive stable of private companies. The corporate deals represent less than a tenth of the athletic department's total revenues, which Patterson estimates will be between $180 million to $185 million this year, including $12.5 million from the Longhorn Network. But the value of UT's sponsorships exceeded the 2013-14 total operating expenses of 100 different Division I athletic programs. Yes, $17 million dollars annually and counting in sponsorship deals for the Texas athletic department is a stunning number, but that is still less than a tenth of UT’s entire athletic revenue from 2013 - 2014 with that other 90% mainly coming from the Longhorn Network and TV contracts associated with the Big 12 Conference and the postseason College Football Playoff which by itself has added over $200 million dollars in new revenue to college football last year. “As part of its UT contract, which also enables it to sell advertising, TV and radio rights, and signage at events, IMG keeps 17.5 percent of gross revenue it generates on the school's behalf. For that privilege, IMG pays UT a $2.26 million annual-rights fee. Just doing some back of the envelope math using the above numbers IMG makes around $700,000 per year on their sponsorship sales deal with the Texas athletic department which is in the 4 to 5 percent range on sponsorships generated which is a little higher than the Roaring Fork Agency would charge for the same work, but pretty much in-line with sponsorship sales work commissions across North America right now. There has been one constant of more and more money in the last three decades since the Supreme Court decided in the NCAA vs. Board of Regents of University of Oklahoma in favor of schools and conferences right to schedule and put together their own television contracts which has seen an explosion in the amount of intercollegiate athletics that is on TV and money that has continues to flow in ever increasing amounts to college athletic departments across America. “It’s difficult enough to compare naming-rights deals for college basketball arenas because of the numerous differences in local economies, arena marketing – both nationwide and locally – of arenas, the population and such. But it’s even tougher to compare based on the new numbers of arenas that have sponsorships. Matt Ensor, assistant director of communications at UNM, researched the number of collegiate basketball venues with title sponsors before the school’s deal with WisePies was announced. His discovery is that UNM is in rare company following its $5 million, 10-year deal with WisePies. The Mountain West Conference which is not one of the larger “Power Five Conferences” that now dominate major college sports in America has a number of up-and-coming sports teams including Boise State which has fielded a top college football team for over a decade along with many MWC schools with basketball teams that have made it deep into the NCAA Basketball Tournament on numerous occasions. “On Monday, the University of New Mexico received $100,000 from WisePies Pizza & Salad, which marks its first payment on its $5 million agreement to buy the naming rights to The Pit. WisePies Arena, formerly The Pit, is named after the local pizza and salad chain. $600,000 annually in 2016, 2017, 2018, 2019, 2020, 2021, 2022, 2023! Now that is a backend loaded naming rights contract and if the Roaring Fork Agency had been advising the University of New Mexico on this deal we would have pushed for UNM to get much more compensation upfront from WisePies in the first couple of years because it’s next to impossible to know what will be going on 5-plus years from now with WisePies or any other company for that matter that could go out of business, be bought, be sold, or be part of a much larger company that might not want to be making $600K annual payments for an arena naming rights deal in the early 2020s contract in place or not! What do sponsors want to find under the tree for the 2014 holiday season? What would they like to see properties do better? IEG SR poised those questions to marketing execs at six of the industry’s biggest sponsors: Bank of America, PepsiCo, Nationwide Insurance, SAP, UPS and Volkswagen. Below are edited excerpts from their responses. Wish list: Added value in the form of content with digital and social distribution, coupled with a better understanding of what drives our business and marketing goals and objectives. What properties need to do better: Identify areas of improvement or best-in-class activations where we could either benefit directly or leverage to drive greater value, as well as business integration with other property partners where there is product and/or brand synergy. What properties need to do better: At Nationwide, we believe sports marketing / sponsorships need to move the needle just like any other part of the marketing mix. However, measurement needs in this space require a tremendous amount of work and attribution to specific performance metrics is very difficult. Like most sponsors, finding the secret sauce or "Christmas present" that delivers full attribution of investment and focus against KPIs would be ideal. Nationwide's sports marketing objectives are focused on brand building, fan/client engagement and philanthropic support. It's through that lens that we are able to align specific KPIs for all properties at an enterprise level to ensure sports marketing efforts are driving value. What properties need to do better: More willingness to co-create value – Properties and brands have greater opportunities to work together to find mutually beneficial solutions, including customizable sponsorship packages tailored to brands and their specific needs. Better access to fan analytics – Properties know their fan bases best. Providing sponsors with access to those insights and analytics unlocks a wide range of innovative consumer engagement opportunities that enhance the fan experience and help sponsors plan, execute and measure sponsorship activation. For example, insight on a fan’s in-venue location and team preference can allow PepsiCo to create unique consumer touch points, such as mobile offers at concessions (e.g. a coupon for a Pepsi and pizza promotion). There is just some great insight in the above IEG article on what decision-makers at companies that are making Billions of Dollars worth of sponsorship investments each year are thinking and these are the kinds of things we talk to our clients about all the time in an effort to build an event and sponsorship program that can drive real value for the sponsoring company which is often committing large amounts of resources to their sponsorship investments and thus want a strong return on their significant sponsorship commitments. “For non-traditional brands seeking to create awareness among consumers, the usage of sports sponsorship is often the most proficient vehicle in accomplishing just that. There is no better example of this than that which is provided by Stryker Corporation’s recent announcement that it was becoming the “Official Joint Replacement Product of the PGA TOUR”. While the words joint replacement and professional golf aren’t exactly synonymous, from a marketing perspective there is actually a great deal of synergy between the two. Much like other medical device and pharmaceutical companies, Stryker Corporation, was faced with a perplexing marketing question – How do they bring awareness of their company and its products to the general public while still adhering to the traditional ethics of the medical industry? After all, it should not be the patient that recommends to the doctor what type of treatment they should be receiving. It doesn’t take a rocket-scientist to see the strong connection between active golfers and the potential for marketing Stryker’s hip-replacement products to people that play the game of golf, but it does take the marketing people at Stryker along with the PGA Tour to put together a strong sponsorship partnership program that makes sense for both sides and as Jason Belzer details in his column this is exactly the kind of WIN-WIN sponsorship agreements that need to be put together more often that will drive more customers and thus revenue & profits to the sponsoring company which after all is the only reason why a company should be committing sponsorship dollars in the marketplace. If there is an issue that comes up time-and-time again when pitching sponsorships to companies it is the ROI (return-on-investment) that a particular sponsorship could generate and thus figuring out ways to measure the direct impact of sponsorships will be more and more important going forward for both companies and agencies pitching sponsorship opportunities. “The Fédération Internationale de Football Association stands to make $1.4 billion from sponsorship deals with 20 major companies during the World Cup in Brazil. That’s 10 percent more sponsorship revenue than from the last World Cup, in South Africa.1 Although significant, that’s still far below US corporate spending on sports sponsorships, which grew to an estimated $20 billion in 2013—equal to one-third of total US television advertising and one-half of digital advertising. Considering the huge amounts involved, you would imagine sponsors of athletes and events have clear answers when asked about their return on investment (ROI). You would be wrong. Industry research reveals that about one-third to one-half of US companies don’t have a system in place to measure sponsorship ROI comprehensively. And that’s costly in another way: in our experience, executives who implement a comprehensive approach to gauge the impact of their sponsorships can increase returns by as much as 30 percent. 1. Cost per reach. Marketing executives should evaluate cost per reach—the number of people exposed to the sponsorship in person as well as through media such as TV, radio, and print— on a quarterly basis using data from internal sources or the sponsorship agency. Costs include not only rights fees but also activation costs (for example, promotional booths and merchandise) and advertising. Reach calculations should favor exposure to the target demographic over total numbers. To monitor worldwide sponsorships using cost per reach, one retailer built a database using cost and reach data from its agency, the sponsors, and publicly available sources. Analysis revealed that 15 percent of its properties were twice the average cost per reach as others. Some sponsorships (such as a premier sports team) had high costs while others (a music concert, for instance) delivered low reach. The database also identified the sponsorships that did not reach the advertiser’s target demographic. With these insights, the company reallocated its sponsorship dollars to better vehicles that increased overall reach by 20 percent at the same cost. 2. Unaided awareness per reach. We find that companies often spend a lot of money acquiring sponsorship rights but very little on activation—that is, marketing activities such as promotional booths and merchandise to promote the sponsorship. Our experience, as well as IEG research from 2011, shows wide variance: for every $1 spent on sponsorship rights, companies devote anywhere from $0.50 to $1.60 to activation. That means many corporations skimp, missing huge opportunities to magnify a sponsorship’s impact on sales or awareness. One US consumer-packaged-goods company, for example, allocated 80 percent of its sponsorship budget to rights fees and only 20 percent to activation. After analyzing its efforts, it found that increased activation resulted in greater unaided awareness and higher brand recall. With this insight, the company shifted resources from its low-performing properties to increase activation for its standout sponsorships, increasing unaided awareness of them by 15 percent. 3. Sales/margin per dollar spent. Linking sales directly to sponsorships is typically challenging, but two approaches can help to quantify it. The first is a two-step approach that ties spending on sponsorships to key qualitative marketing measures such as unaided awareness, propensity to buy, and willingness to consider. It then tracks the impact of each variable on short- and long-term sales. The second approach, based on econometrics, uses data on spending and reach (among a host of other media variables) over an extended period to establish links between sponsorships and sales, and then isolate the impact of sponsorships from other marketing and sales activities. A handset manufacturer, for example, followed the first method, setting up a quarterly consumer survey to measure the impact of sponsorship on sales. By conducting advanced analysis on the data set, the company was able to identify the sponsorships that were truly driving consumer willingness to consider the company’s products, which it then linked to sales. The analysis showed a tenfold ROI difference between the top-quartile and bottom-quartile sponsorships. The company now uses this method to help with negotiations during yearly reviews of its sponsorships. 4. Long-term brand attributes. Sponsorships have the potential to reach beyond short-term sales to build a brand’s identity. Brand strength contributes 60 to 80 percent to overall sales,3 making this benefit critical for sustained, long-term sales growth. A qualitative assessment or survey can help companies identify the brand attributes that each sponsorship property supports. Analysis of those results helps marketers determine which sponsorships are reinforcing a common brand theme. The handset manufacturer above used surveys to determine that a number of its sponsorship properties were misaligned with the brand attributes it wanted to convey—some actually had a negative ROI. The advertiser shed the poor-performing sponsorships and developed new messaging and activation plans for the others. 5. Indirect benefits. Sponsorships may stimulate indirect sales—for instance, when advertisers host executives at sponsored events or when they’re part of a balance-of-trade commitment. Therefore, any analysis of sponsorships must also account for these indirect benefits. Companies often either neglect or overestimate these sources of revenue when calculating ROI. A financial institution, for example, used its sponsorship of a golf tournament to host clients for its wealth-management business. Analysis revealed that the impact of the tournament on indirect sales covered the sponsorship costs, making it one of the most effective sponsorships in its portfolio. A key metric that the Roaring Fork Agency has been working on relative to its current sponsorships is Cost Per Reach with a focus on the targeted demographic within the overall group of people that are exposed to the sponsorship which is vital in determining if a sponsor is getting the Bang for their Sponsorship Buck. It’s not always easy to get an accurate measurement of Cost Per Reach for sponsorships, but it’s worth the effort to try to within an overall goal of figuring out the ROI for each and every sponsorship investment because that will allow companies to both better decide on whether to continue with their current and potential future sponsorship plans. Another great study by McKinsey & Company on reaching consumers in the marketplace was their look at…. ….from 2009 which opens with some interesting insights into how important it is to reach consumers at critical times when they are making their buying decisions which will often lead companies to considering sponsorship which falls outside of mainstream marketing that is increasingly ignored by a distracted public that can be reached by unique sponsorship strategies that reach consumers directly. Amen to that McKinsey & Company. Sponsorship is such a segmented market with deals often being put together with people that are doing business with each other for the first time it is often hard to understand what the person sitting across the table is thinking at any given moment during the sponsorship sales process and that is why blogs like the one Tyler Mazereeuw puts together at his Sponsorship Alliance website are so helpful in getting the people’s across the table from you points of view. “Based on the overwhelming requests for this candid look into the reality of today’s marketplace, I’ve decided to adapt the material and post it on my blog. There’s a lot of content so I’ll be breaking it up into a few a different parts, which I’ll send out concurrently over the next couple of weeks. 1. Disappearing Act – no return phone calls and/or emails. 2. Asking for a proposal before a conversation takes place. 3. Lack of transparency when passing on an opportunity e.g. using budgets as a quick and dismissive tactic. 4. Unqualified opinions and personal bias towards a property. 5. Those afraid of saying NO (be honest with us). 1. Lack of research and understanding – assuming you know my business. 2. Relying on just our website for company information, sponsorship strategy etc. 4. Over promise, under deliver. 5. The “Olympic Proposal” – gold, silver and bronze packages. 7. “Filler” – don’t fill the page with meaningless information or assets. 8. Can’t take “no” for an answer…we aren’t at the bar. “Before you dive in to this third and final installment of the Sponsorship Tango, be sure to check out Sponsorship Tango Part 1 (Top 10 things that frustrate me as seller) & Sponsorship Tango Part 2 (Top 10 things that frustrate me as buyer) for context. Here are the five dance steps that will help you maximize your sponsorship discussions. Thanks again to Tyler Mazereeuw and the great sponsorship insights that he posts at his Sponsorship Alliance website. There is so much that goes into putting together a sponsorship deal for both an event/venue and the sponsoring company that we here at the Roaring Fork Agency often finding ourselves doing a lot of education along the way on the numerous things that need to be worked-through and completed before a successful sponsorship deal is finalized. Luckily our friends at Elevent Sponsorship in Montreal, Canada have done a great job of putting all of those important sponsorship issues and considerations into one place on in their company blog and it is a must read for anyone involved in the world of sponsorships. Below you find that sponsorship blog post by Elevent Sponsorship which is such a great read we find ourselves coming back to it again and again and often find ourselves forwarding some or part of it to our event/venue or company partners. If you click through to the actual blog post on the Elevent Sponsorship webpage you can read a lot more on each of the below Sponsorship Categories. Enjoy. "A sponsorship is a sophisticated and complex marketing tool; it entails an entire strategic process of solicitation, negotiation, and customer service. What’s more: professionals who are responsible for sponsorships must fully grasp both traditional and non-traditional marketing communication channels as well as the inner workings of several different markets. Sponsorships can be leveraged to achieve many objectives and reach different target audiences. It is therefore important to understand the basics before launching a full-fledged sponsorship campaign. This practical guide will help you efficiently develop and manage a results-driven sponsorship proposal. It includes our decades of experience, industry best practices, and the latest research on sponsorship effectiveness. Have a great read! The Elevent Team. A sponsorship is partly based on what a property can offer a sponsor in terms of rights and benefits. The first step to developing an attractive sponsorship proposal is to draw up an inventory list of all the benefits and assets. A sponsorship structure can be relatively straightforward with different levels: a title sponsor, presenting sponsor, a series of major sponsors, standard sponsors, suppliers, and media partners. It is essential to establish partnerships with different media outlets to help you build your event’s notoriety and get maximum visibility. You can create a synergy between media partners and sponsors that will generate great results and decrease the costs of the projected media buys in your communication plan. Learn the basics for evaluating your sponsorship assets. Soliciting sponsors is one of the biggest challenges when trying to raise funds. It takes more than good sales techniques; you must begin by putting together a good strategy and better understanding the inner workings of sponsorships. Success comes from long-term partnerships. Although signing a long-term agreement over several years may appear risky for both parties, it also offers undeniable advantages. A sponsor’s logo is nothing without activation. Communication strategies that focus on the association between the sponsor and sponsored property is called the activation of the sponsorship. Sponsorship activation is crucial in optimizing the efficiency of a sponsorship and ensuring a level of visibility for your organization. As a sponsored organization, you must take decisions on a daily basis. A sponsorship program entails as much management as putting together the event and selling tickets. This practical guide ends with a bonus where you can find sponsorship category examples, generic activation ideas and example of sponsorship inventory." Something that we have seen more and more of in recent years in the sponsorship world is companies attaching a “Purpose” to their sponsorship commitment that spells out in very clear terms that the company hopes to do more than just gain more orders, customers, or sales from the money they are spending on the underlying sponsorship. Sports is at the center of globalization (Man City and the New York Yankees formed a Major League Soccer team) and new technologies (think Levi’s Stadium). Sports is the lifeblood of broadcast and cable networks. Sports apps, video games, fantasy leagues and stats are fueling the growth of new media and new delivery channels. And increasingly, sports is being used to create social progress. The link between sports and social progress is found in two of the biggest trends in business today, social media and corporate social responsibility or what we at IEG call corporate social opportunity. As Lesa Ukman points out sports is today the ultimate sponsorship platform for companies interested in driving their brand, products, and/or services to wide population groups and an added bonus to gaining lots of eyeballs seeing a company’s name in sporting contests is the deep commitment by sports fans to their teams which is a hard thing to find in the media marketplace of 2014. “Linking an organization’s reason for being to improving lives and impacting society amplifies the ROI of any sports partnership. 1. The most viewed ad around the 2014 FIFA World Cup was Shakira’s “La La La (Brazil 2014),” which featured her official song of the tournament and a partnership with Danone’s Activia yogurt in support of the World Food Programme’s School Meals initiative. 2. Chobani, sponsor of the U.S. Olympic Team, incorporated opposition to Russia's anti-gay laws into its packaging and creative during the Sochi 2014 Winter Games. Its visible support of human rights provided a point of differentiation and measurably increased purchase consideration, according to YouGov BrandIndex. 3. Research by Lloyds, official bank of London 2012, revealed that customers aware of its Olympic partnership were 40 percent more likely to recommend the bank, but customers aware of its Olympic tie as well as its community overlay to the Games, Lloyds Local Heroes, were 60 percent more likely to recommend Lloyds. Purpose can take many forms—breaking down barriers for disabled athletes and normalizing views on disable sport, combating childhood obesity, empowering disadvantaged communities, and more. What they all have in common is a new approach to driving shareholder value, a shift from marketing to service, from pushing messages out to drawing people in by making a positive difference—to individuals, communities and/or the planet. Everyone in sports should be looking at the social value of what they are doing, because there is a cause-and-effect relationship between financial performance and purpose. Brands that mean more make more. People connect with products and services that speak to powerful emotional drives and give meaning to purchasing decisions or strengthen loyalty to a team or club. To help elevate the world of sports, the value that you create as sponsor, broadcaster or rightsholder should be in this zone. ….a recent major sponsorship commitment is a terrific example of how adding “Purpose” to a sponsorship can fundamentally change how a company’s commitment to things beyond the bottom-line could be viewed in the marketplace. “Beginning in 2015, AutoNation Inc. will become title sponsor of a new college football bowl game that will raise money for breast-cancer research. The AutoNation Cure Bowl, played at the Citrus Bowl in Orlando, will feature teams from the American Athletic and Sun Belt conferences. The first matchup will air Dec. 19, 2015, on CBS. AutoNation has been working on the sponsorship for a year, but it wouldn't have happened if it were a traditional bowl game, without the charitable tie-in, CEO Mike Jackson said. The net proceeds of the bowl game will benefit the Breast Cancer Research Foundation. AutoNation CEO Mike Jackson explains very well that just sponsoring a college bowl game wasn’t enough to entice his company to become the sponsor of this new college bowl game but that when the sponsorship was tethered to raising money for breast-cancer research which is the underlying “Purpose” of the sponsorship commitment then Jackson and AutoNation became very interested in becoming involved in the event. The lesson that can be drawn from companies being more willing to commit to sponsoring events when there is an underlying “Purpose” that the event will be supporting is that there are ways to put together “Win-Win” sponsorship arrangements that go beyond just trading a company’s money for sponsorship and it is this kind of out-of-the box thinking that can help to put together both more sponsorship arrangments and more meaningful sponsorship deals. If there is one thing we hear over and over again from the companies we are pitching sponsorships to and then working with to successfully implement event sponsorship partnerships it is how important that the company and brand connect directly to the consumers it is trying to reach with their sponsorship investment. Which explains in part why ‘Connections Planning’ has become so popular in modern marketing departments. What is the best way for brands to ‘connect’? Where should my brand be, what should it say, what type of behaviors should it exhibit? But what are the golden rules to successful connections planning? Is there a connections Silver Bullet, a one size fits all approach? What types of connections work best? And what is the role of sponsorship in all this? One school of thought advocates that in a digital and data driven world, great brand connections come from personalization. The more we know about customers, the more targeted our communications can be. One-to-one, personalized, sniper-like interventions. Personalized messages, served to tiny groups of individuals, hitting consumers at the appropriate time, place, weather or even mood. Hence programmatic buying, demand-side platforms, real-time bidding and the like. The assumption is that pin-point targeting delivers the holy grail or marketing ROI. In sponsorship circles, this places much emphasis on personalized activation, pre-event, live and afterwards. But does ‘connecting’ only mean personalized and precise – can connecting in a meaningful way still take place at a mass or blanket level, and does it have the same value? Where a recipient of a message knows that what they are receiving and experiencing is the same as Mike next door, Manuel in Spain or Minal in India. What’s the value of this delivery? ….being mentioned prominently by any all media outlets covering events at the stadium. Who are we trying to connect with? – a deep attitudinal and behavioral understanding of the audience – using technology and, in particular, social to inform the view of the customer. What is the market context, where does the brand fit in? What does the brand need to say? – the key brand messages required to create desire. That is just Brilliant and Precise Language by Pete Edwards on exactly who and what companies should have their focus on when trying to drive brand awareness in the marketplace! Now we here at the Roaring Fork Agency are off to incorporate Pete Edwards’ ideas into our next sponsorship pitch! Thanks Pete!